The availability of a movie on video streaming services cannibalizes sales of physical media. This is the general conclusion of the first academic study, published this month, that investigates the extent of this cannibalization. The Causal Effect of Video Streaming on DVD Sales: Evidence from a Natural Experiment is carried out by three Hong Kong business school academics. The ‘natural experiment' is a case study that focuses on Epix’s 1 October 2015 decision to switch its streaming partnership from market leader Netflix (43.2 million US customers) to number three Hulu (10.3 million). Consumers’ restricted online availability of Epix content on the smaller Hulu platform led to a 24.7% increase in DVD sales in the three months following the switch. Epix is an entertainment cable network that features movies and TV shows distributed by Paramount, Lionsgate, and MG. Epix’s collections include both Hollywood blockbusters, such as The Hunger Games: Catching Fire, The Wolf of Wall Street, Transformers: Age of Extinction, and other small-budget and lesser-known titles. The study finds that cannibalization of physical sales is more severe for DVDs released more recently and movies with better theatrical performances than those released earlier and those that performed poorly in theatres. Consumers’ demand for the physical formats of better-performing titles is likely to be high. The authors suggest that content owners should, thus, delay or even avoid offering these titles in the streaming media to reduce cannibalization. On the contrary, making titles released a long time ago or without great box office revenues available for streaming can generate additional revenue. It remains that content owners face a dilemma: to decide when a title should be made available for streaming. Although postponing the release of titles in a streaming distribution channel enables content owners to extract the most benefits from physical sales, it would certainly become less desirable to streaming service providers if streaming availability is delayed excessively. The authors accept the study bears a few limitations. First, the investigation only involves movie titles that were available for streaming for some time. Various streaming subscribers may have already watched these titles. Thus, their demand for physical discs would be lower when the streaming option is gone. Second, aside from streaming and physical media, movies are also distributed in digital formats, such as electronic sell-through and digital rentals. Some consumers may switch to other digital outlets after the supply on streaming platforms decreases instead of purchasing physical discs. Third, pirating is not considered in the study. Although online pirating may still exist, the authors optimistically believe its popularity decreased significantly, particularly after legal digital distribution channels are made available. We can add another limitation. Movies successful at the box-office, irrespective of whether they are available for streaming, are good gift-giving candidates and can actually trigger more disc sales. 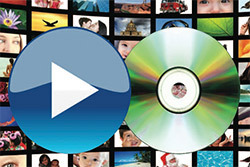 Up to 30% of DVD and Blu-ray annual sales take place in the pre-Christmas period as presents. The full study can be downloaded here .